This poster is named STOP THE PLANT, and it really caught my eye. 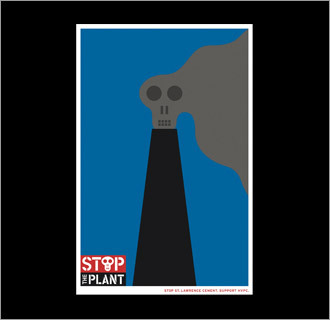 Stop the Plant is a grassroots campaign to prevent the construction of a mammoth, 1,800-acre cement plant, pit and mine in New York’s scenic Hudson Valley. Area resident Woody Pirtle designed a poster that uses the plant’s monolithic 40-story stack as a powerful image of blight against the blue sky. This simple and impressive piece is little bit scary because of using scull in the smoke; however, those who see this poster easily understand what the message the poster indicates by that. This work is made with 3 colors; Black, Blue, and Red. Because of the first project I had, I know how difficult it is to make something within the regulations, so I am impressed how beautiful this piece is more than I would have before my first project. His artwork is mostly simple, and has strong messages. I am really happy to work on the second project with his artwork!